Why choose Peninsula Regional Medical Center for your weight loss surgery? Batriatric surgery is helping thousands of people achieve their weight loss goals across the nation and here on Delmarva. On the Eastern Shore of Maryland, Peninsula Regional Medical Center was the first to offer patients these surgical options. Our experts have created a program that is patient-centered with state-of-the-art technologies and procedures you need to get rid of excess weight and keep it off. 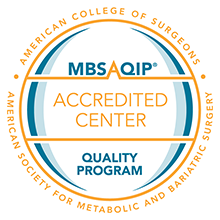 PRMC offers three American Society for Metabolic and Bariatric Sugery (ASMBS) approved procedures: sleeve gastrectomy, gastric bypass (roux-en-y bypass), and the biliopancreatic diversion with duodenal switch. You and your physician can determine which best suits you. Your doctors will review all of your options and answer your questions before scheduling your procedure. To learn more about bariatric surgery services, diet, lifestyle changes, exercise and other options, contact PRMC's bariatric coordinator at 410-912-6949. PRMC was the first hospital on the Eastern Shore to be named a Center of Excellence by both the American College of Surgeons and the American Society for Metabolic and Bariatric surgery; it is designated a Blue Distinction Center for Bariatric Surgery by CareFirst BlueCross BlueShield; and it has been named a Bariatric Institute of Quality by Aetna.